Photobioreactors are guiding technology for a sustainable future. bbi has integrated the experience of Prof. Pulz in photobioreactor engineering, design and construction into its own life science portfolio after 30 years of know-how production at IGV. Novel automation systems and optimized operational parameters are implemented in bbi’s upgraded photobioreactor series, while we still rely on horizontal glass tubes as main photobioreactor material. 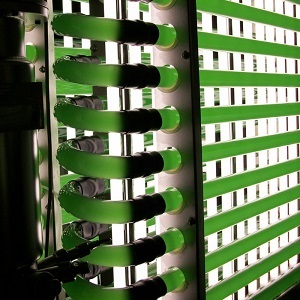 A photobioreactor supplies light and CO2 to microalgae and other plant cells. The algae grow to a dense green, red or brown liquid when additonally supplied with nutrients. 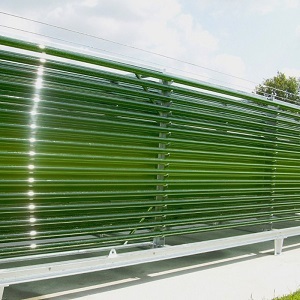 The harvest of microalgae biomass is done with centrifuges or sieves after the algae culture has reached maximal cell count or dry biomass content. 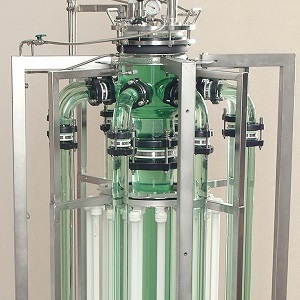 Smaller installations are operated batch-wise, while scaled photobioreactors are operated in fed-batch-mode. 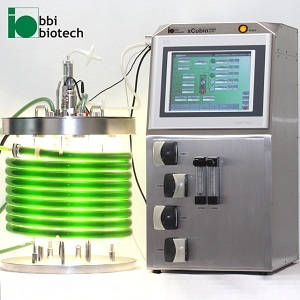 bbi supplies photobioreactors from lab- up to production scale. The successful scaling of our design principles is founded on the application of high-value glass tubes, which do in contrast to other plastic plate or bag systems allow modular and centralized photobioreactor construction layouts. 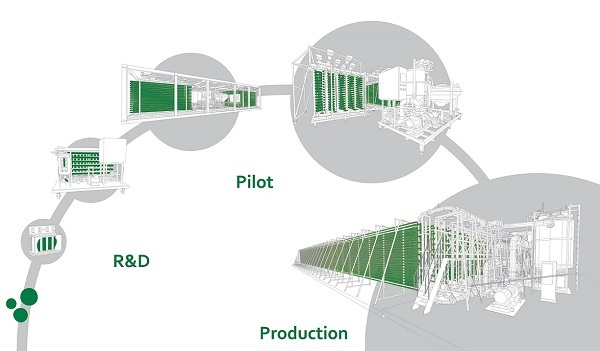 High-end in-situ steam-sterilizable research phototobioreactors for high-level R&D are possible as well as production photobioreactors for greenhouse or outdoor installation. We supply system solutions. We combined proven photobioreactor components with our xCUBIO Bioreactor Toolbox. We contributed automation systems and other technological parts or even did the whole project execution for more than 100 of IGV’s photobioreactors. This know-how has been used to expand our product portfolio after the successful agreement with IGV in March 2015. 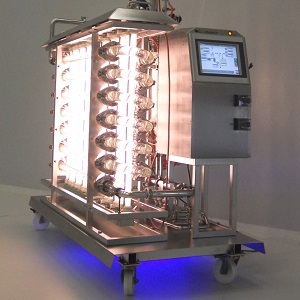 We are now able to supply novel photobioreactors, which are equipped with a handful of optmizations. 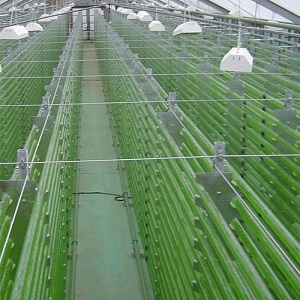 Our customers are R&D-departments of both companies and universities but we do also support projects for the erection of scaled algae production installations with technology from our own life-science workshop. Did we pique your curiosity on some more details? Please do not hesitate to contact us!